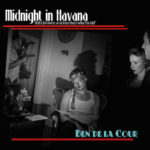 A Bucket Full of Nails staple following the release of his 2013 LP Ghost Light, Nashville’s Ben de la Cour has readied his follow up, Midnight in Havana. Having demoed the title track in 2013, de la Cour has issued “Down to the Water’s Edge,” the first single from Midnight in Havana. With a distant uneasiness, dark undertones and idioms dot de la Cour’s obsessive gothic poetry. To be released on 13 May, Midnight in Havana will be available via Flour Sack Cape Records. In advance of the album’s release, de la Cour will kick off a US tour starting on 22 April. Full schedule here. Stream “Down to the Water’s Edge” below.